When we launched Daily Writing Tips back in 2007, our goal was a simple one: to help people improve their writing skills. Over 2,000 articles later, we believe we have achieved that goal. Today, we are launching a new section called Daily Writing Tips Pro. 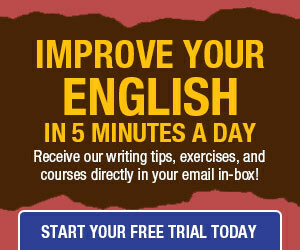 Our plan is to provide more features and tools for our readers who are serious about improving their English. Below, you’ll find some questions and answers that explain how everything works. What features are included in Daily Writing Tips Pro? 1. full articles delivered via email seven days a week. 2. writing exercises delivered via email seven days a week. 3. exercise archives with over 100 interactive exercises on a wide range of topics. 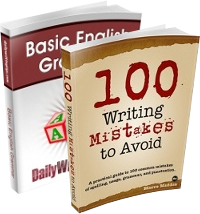 4. writing courses with lessons delivered weekly via email. 5. an aggregator of online writing jobs, updated daily. What if I am already an email subscriber? Current email subscriptions will keep working. The only change is that instead of the full articles, you will now receive an excerpt of each article. In order to read the full article, just click on the link to our website. If you want the full articles via email, you’ll need a Pro subscription. What about access to the website — will it change? Not at all. We will keep publishing all our articles on the website as we have always done, and accessing them will remain completely free. Will the exercises be available on the website? No. Exercises are available only to Pro subscribers. Once you become a member, you’ll start receiving them via email, and you’ll be able to log in to the members’ area to access the exercise archives. What is the cost of the Pro subscription? The subscription costs $9.90 per month if you decide to pay monthly, or $6.70 per month if you pay yearly. We will increase the price in the future, but if you sign up today you’ll be locking your subscription fee, so you won’t be affected by future changes in the price. Which writing courses are included? Right now, the Freelance Writing Course is available. Registration used to cost $97, but you’ll get access to all the lessons as a Pro member for no additional cost. We plan to add one new course every quarter, and you’ll get access to those as well without paying anything extra. Can I try it free before deciding? Absolutely. When you sign up for a Pro account, the first 15 days are free. You’ll need to set up a PayPal subscription, but you won’t get charged a dime during the trial period. If you decide it’s not for you, simply email us, and we’ll cancel your subscription on the same day. Ready to try it? Click here to get to the Daily Writing Tips Pro page, where you can read all the details and sign up. You’ll even be able to test-drive some of our exercises, so check it out!